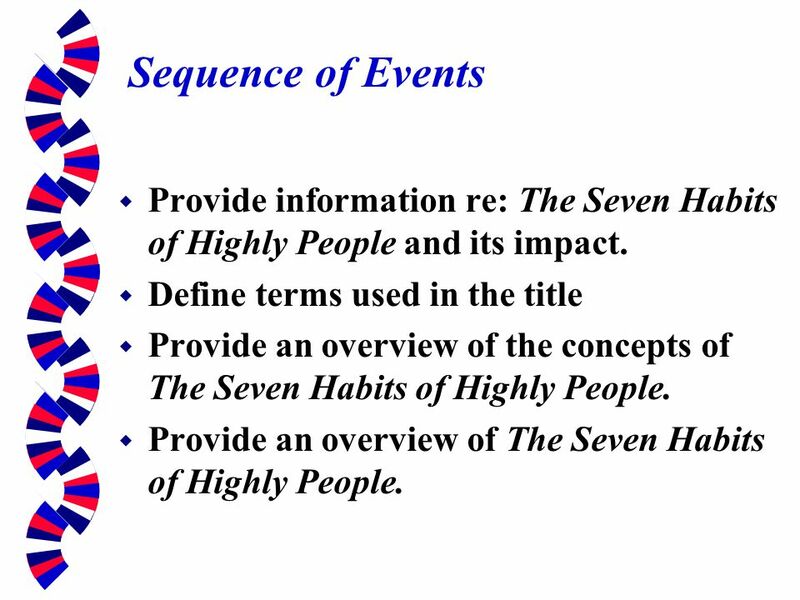 2 Sequence of Events Provide information re: The Seven Habits of Highly People and its impact. 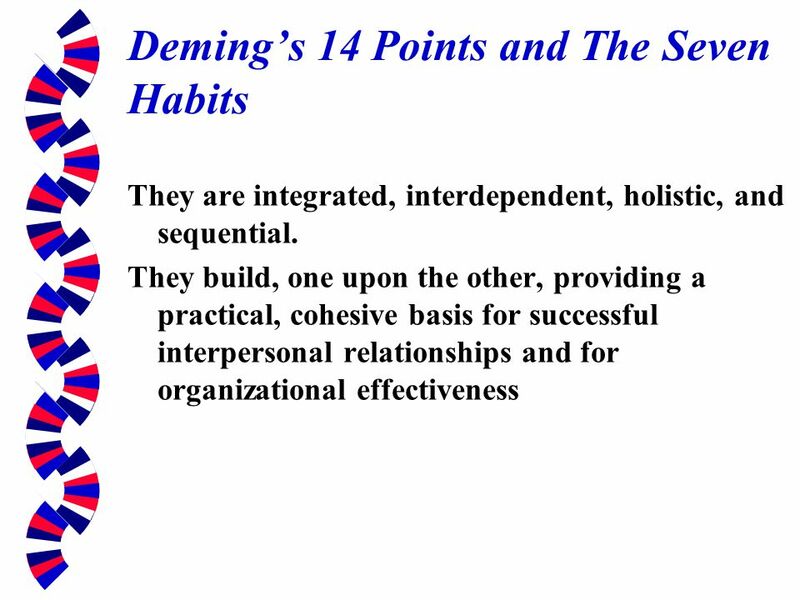 Define terms used in the title Provide an overview of the concepts of The Seven Habits of Highly People. 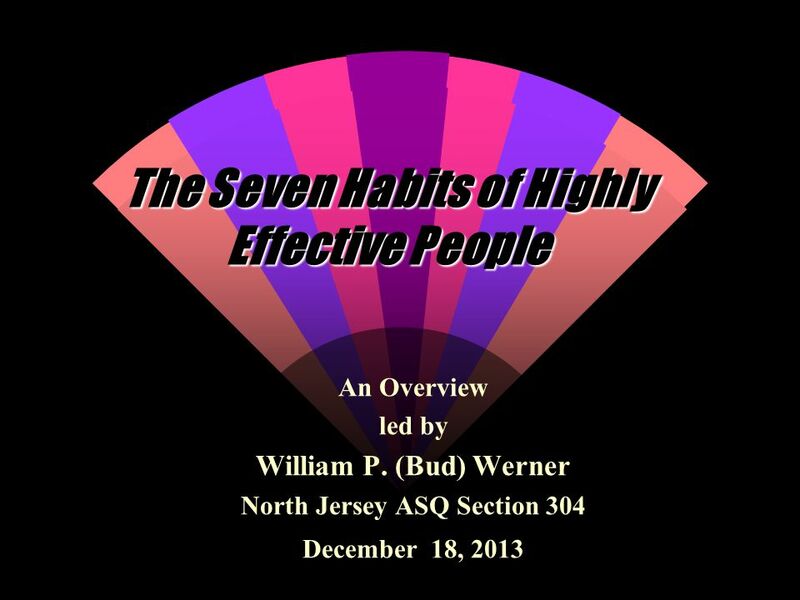 Provide an overview of The Seven Habits of Highly People. 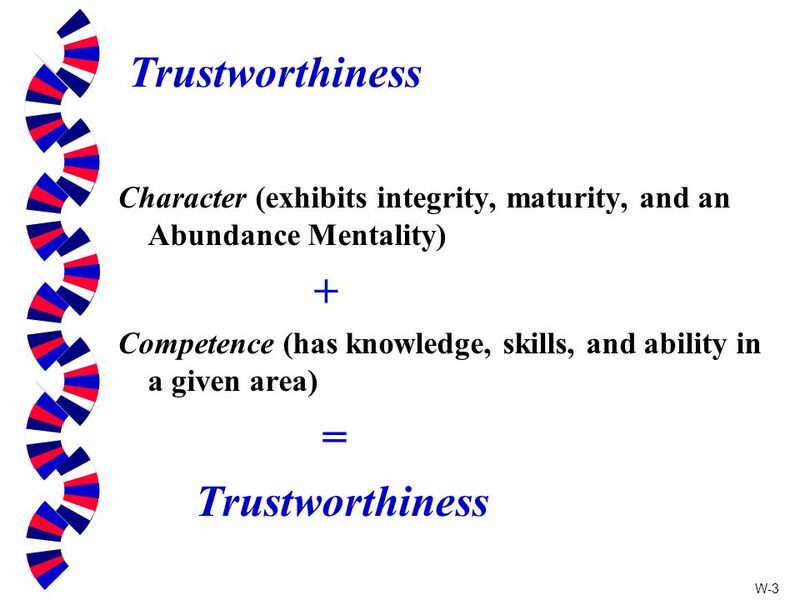 Constructed based on Dr. Covey’s Ph. D. thesis on effectiveness. Published in 1989 and sold 25 million copies now in 38 languages. 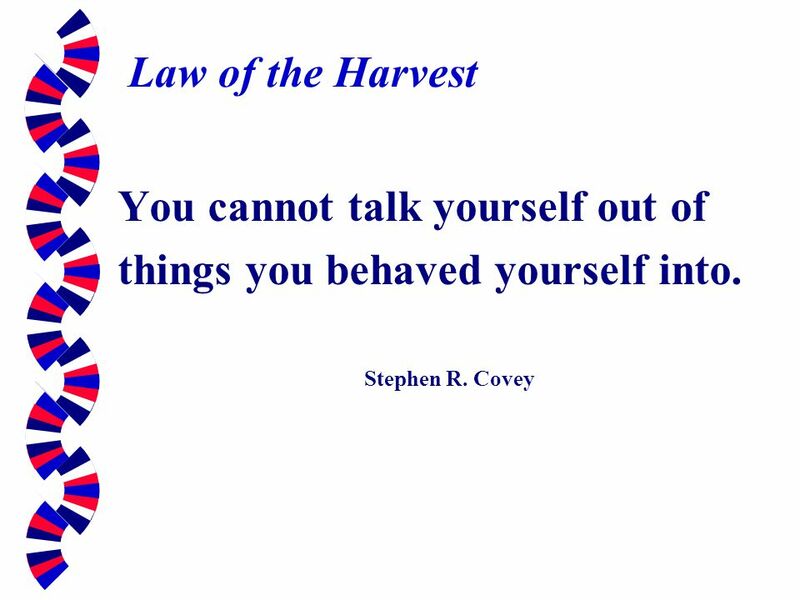 In his #1 bestseller, Stephen R. Covey presented a framework for personal effectiveness. In August 2011, Time listed Seven Habits as one of "The 25 Most Influential Business Management Books". 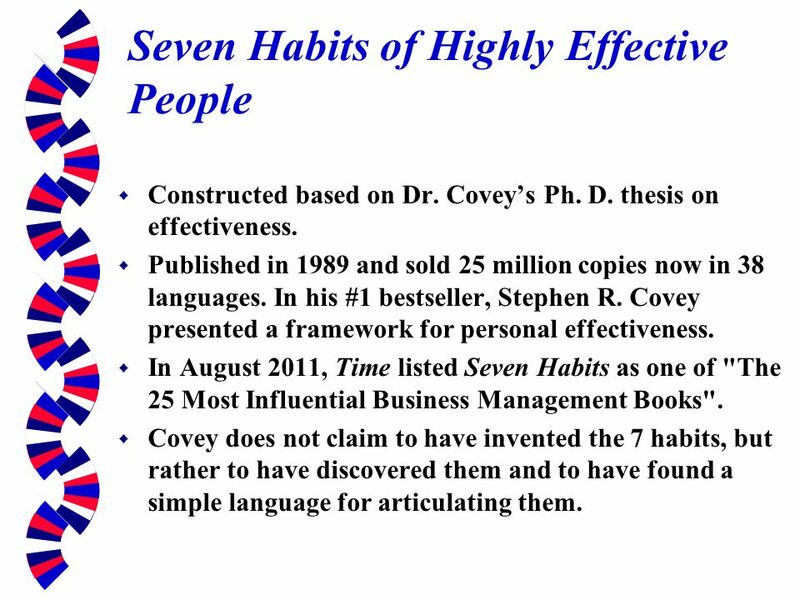 Covey does not claim to have invented the 7 habits, but rather to have discovered them and to have found a simple language for articulating them. 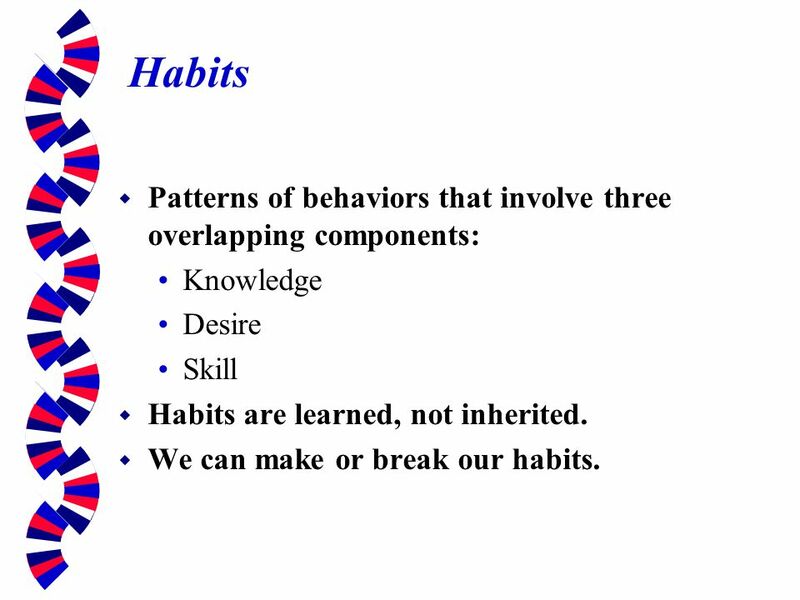 5 Habits Patterns of behaviors that involve three overlapping components: Knowledge Desire Skill Habits are learned, not inherited. We can make or break our habits. 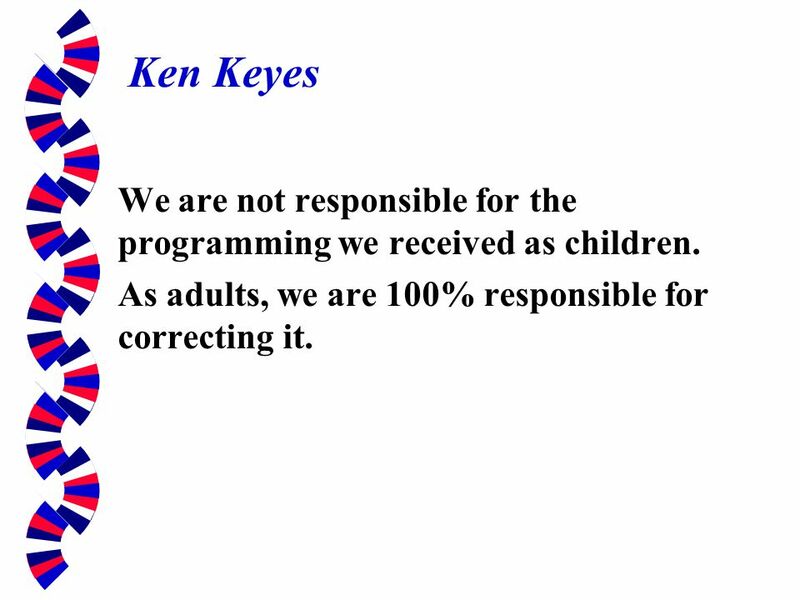 7 Ken Keyes We are not responsible for the programming we received as children. As adults, we are 100% responsible for correcting it. 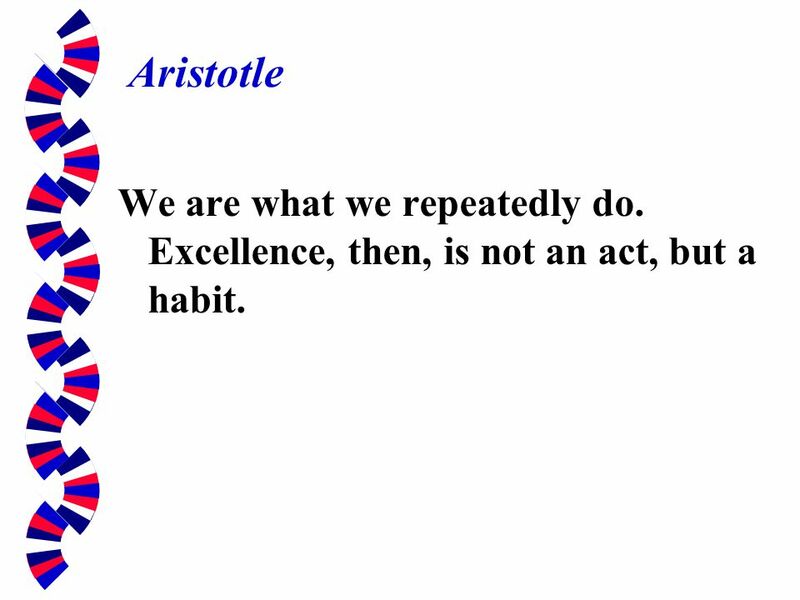 8 Aristotle We are what we repeatedly do. 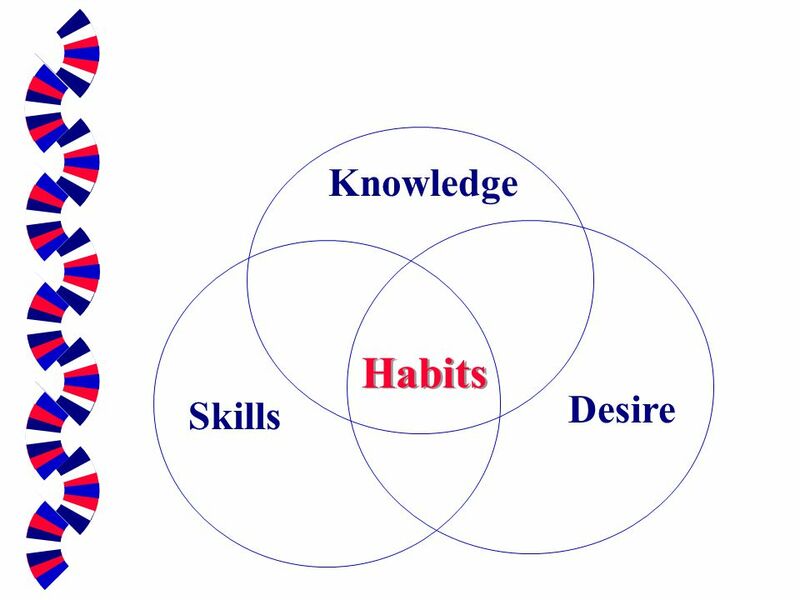 Excellence, then, is not an act, but a habit. 9 What a person is! 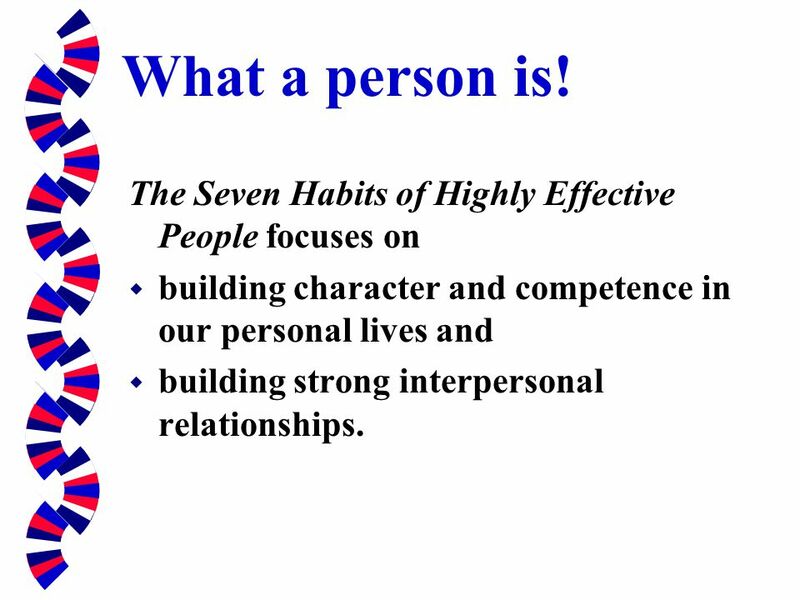 The Seven Habits of Highly Effective People focuses on building character and competence in our personal lives and building strong interpersonal relationships. 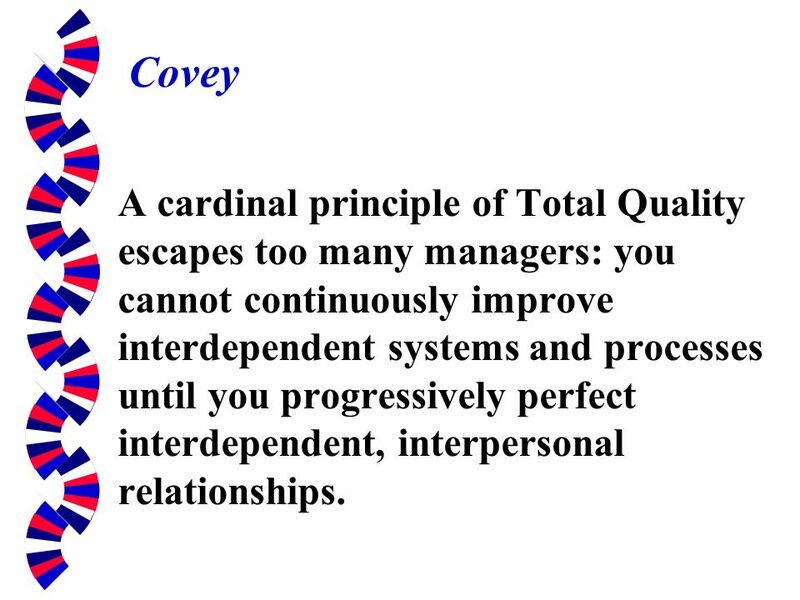 10 Covey A cardinal principle of Total Quality escapes too many managers: you cannot continuously improve interdependent systems and processes until you progressively perfect interdependent, interpersonal relationships. 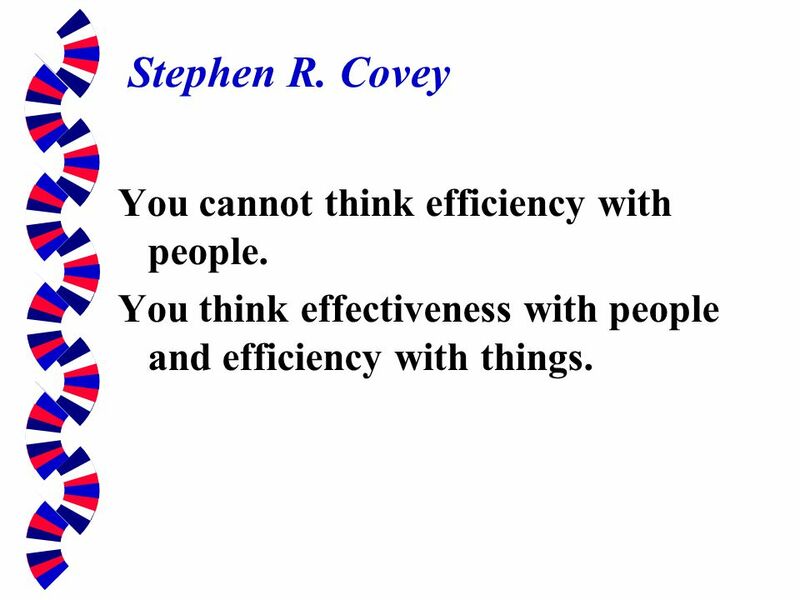 12 Stephen R. Covey You cannot think efficiency with people. 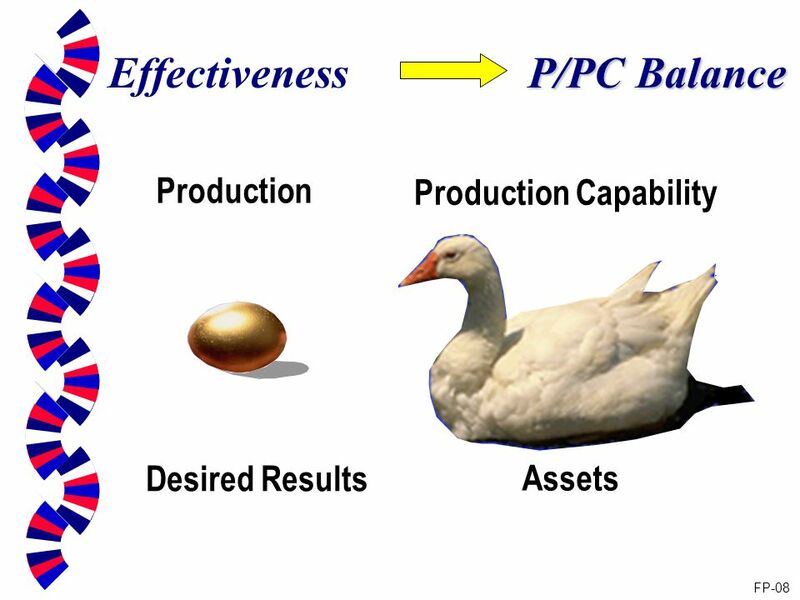 You think effectiveness with people and efficiency with things. 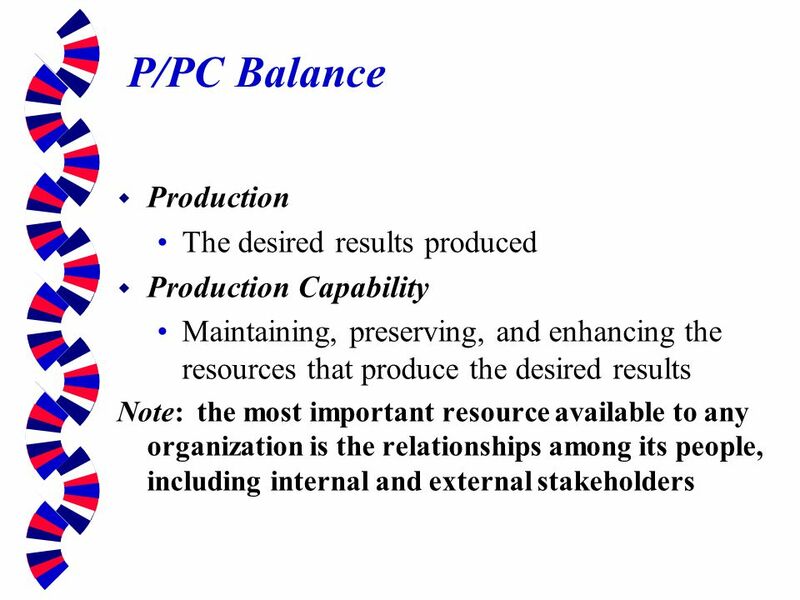 15 P/PC Balance Effective People maintain a balance between achieving desired results (Productivity) and enhancing the assets that allow them to produce the results. 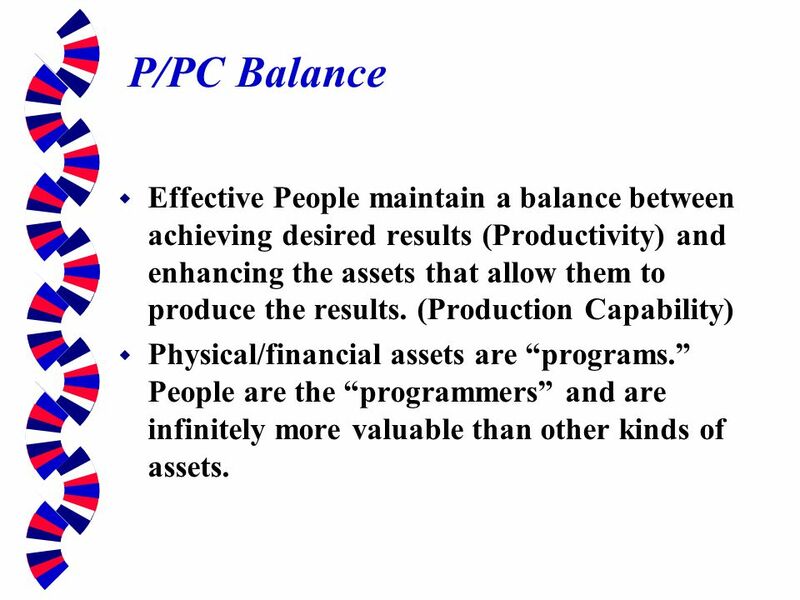 (Production Capability) Physical/financial assets are “programs.” People are the “programmers” and are infinitely more valuable than other kinds of assets. 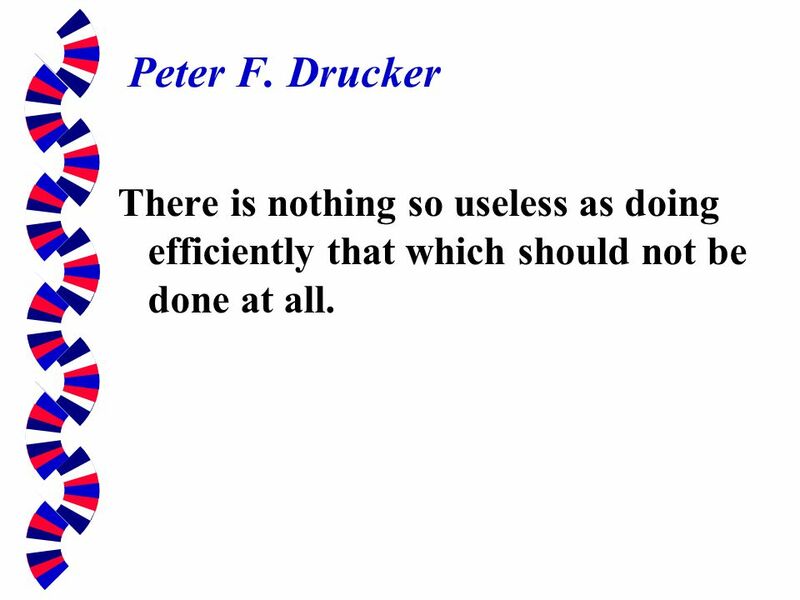 16 Peter F. Drucker There is nothing so useless as doing efficiently that which should not be done at all. 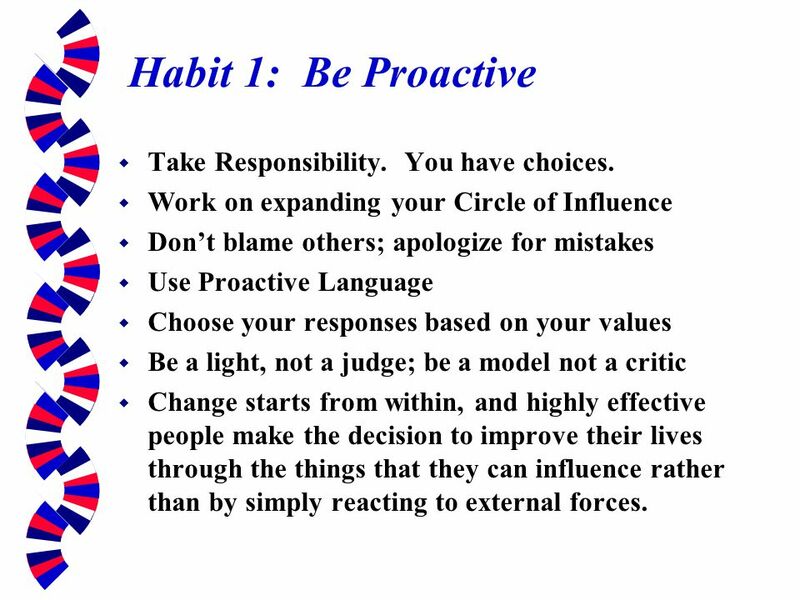 18 Habit 1: Be Proactive Take Responsibility. 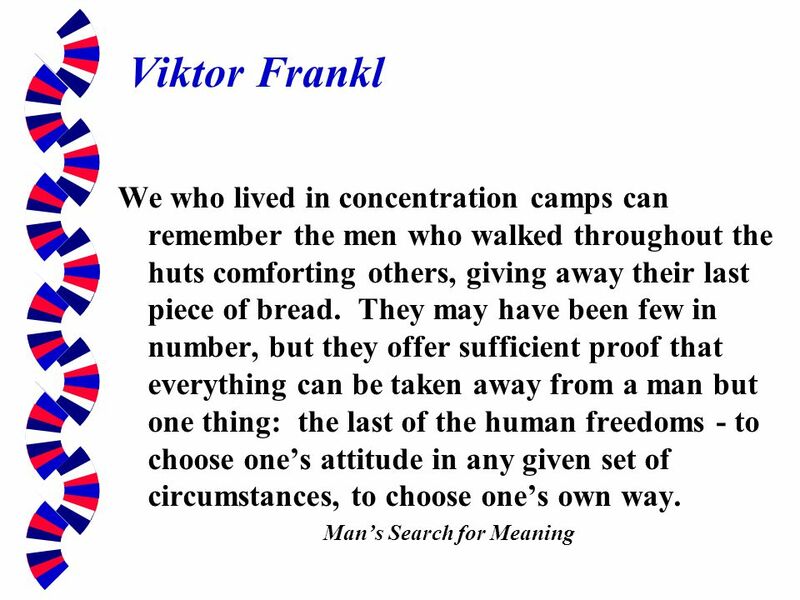 You have choices. Work on expanding your Circle of Influence Don’t blame others; apologize for mistakes Use Proactive Language Choose your responses based on your values Be a light, not a judge; be a model not a critic Change starts from within, and highly effective people make the decision to improve their lives through the things that they can influence rather than by simply reacting to external forces. 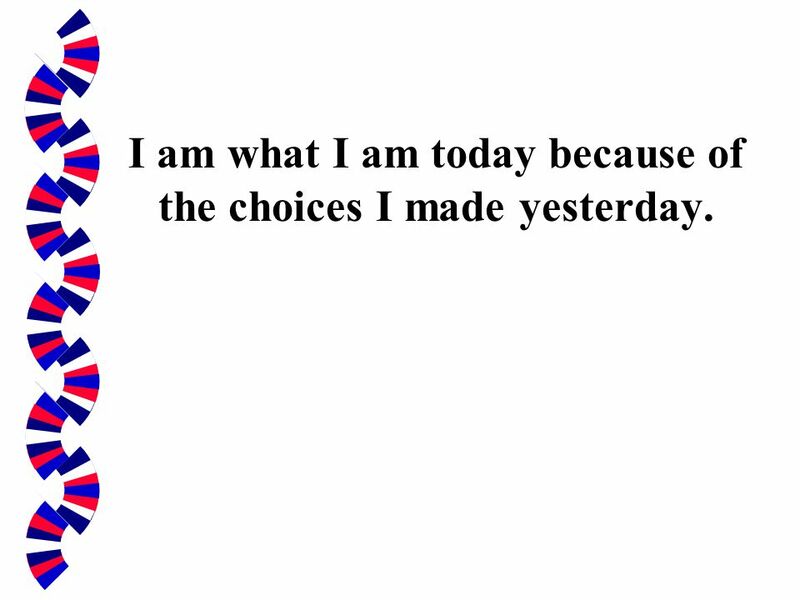 19 I am what I am today because of the choices I made yesterday. 21 You cannot talk yourself out of things you behaved yourself into. 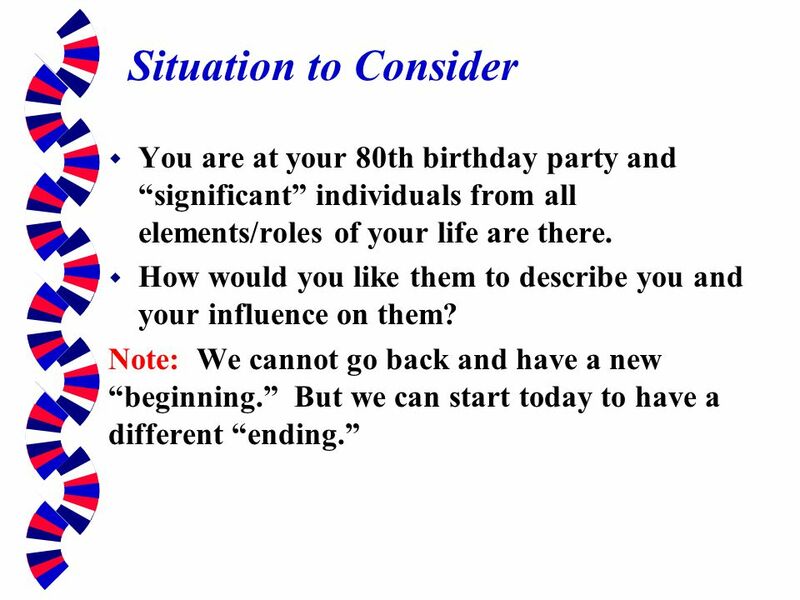 Develop a principle-centered personal mission statement. 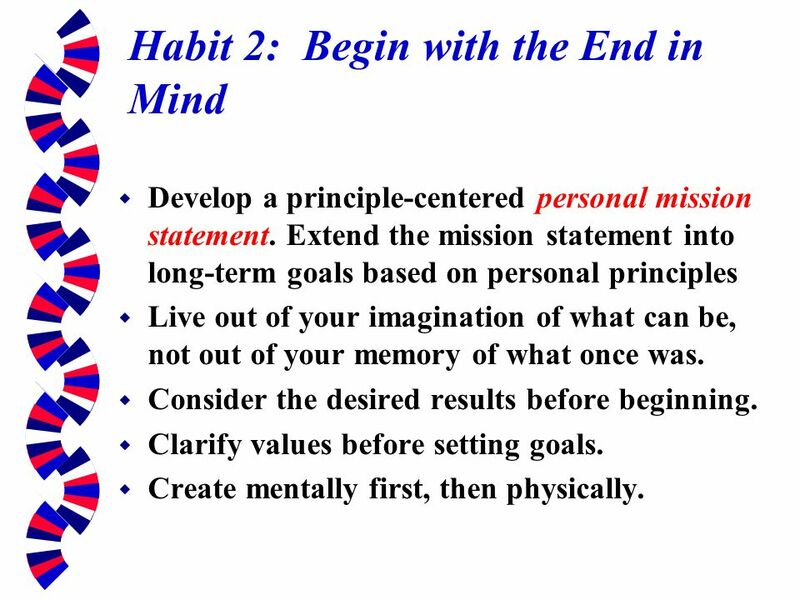 Extend the mission statement into long-term goals based on personal principles Live out of your imagination of what can be, not out of your memory of what once was. Consider the desired results before beginning. Clarify values before setting goals. Create mentally first, then physically. 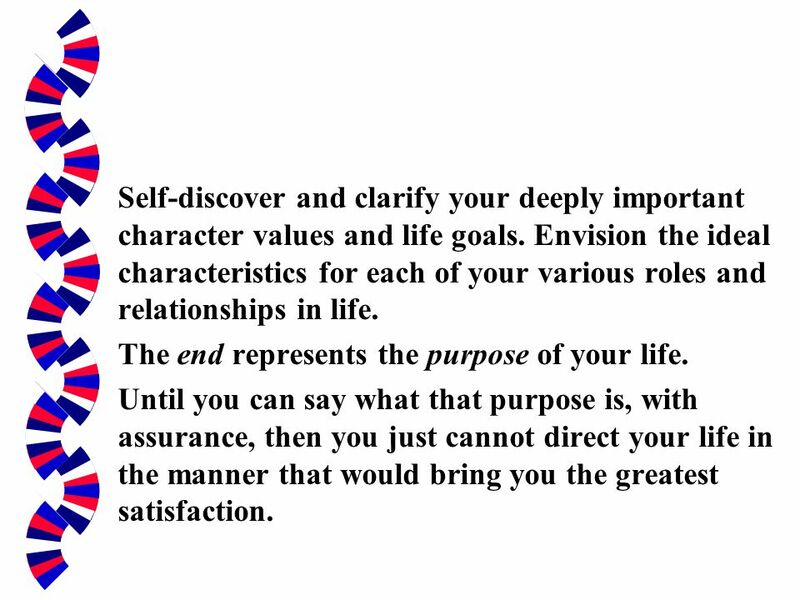 23 Self-discover and clarify your deeply important character values and life goals. Envision the ideal characteristics for each of your various roles and relationships in life. The end represents the purpose of your life. Until you can say what that purpose is, with assurance, then you just cannot direct your life in the manner that would bring you the greatest satisfaction. To manage our lives effectively, we must keep our mission in mind. 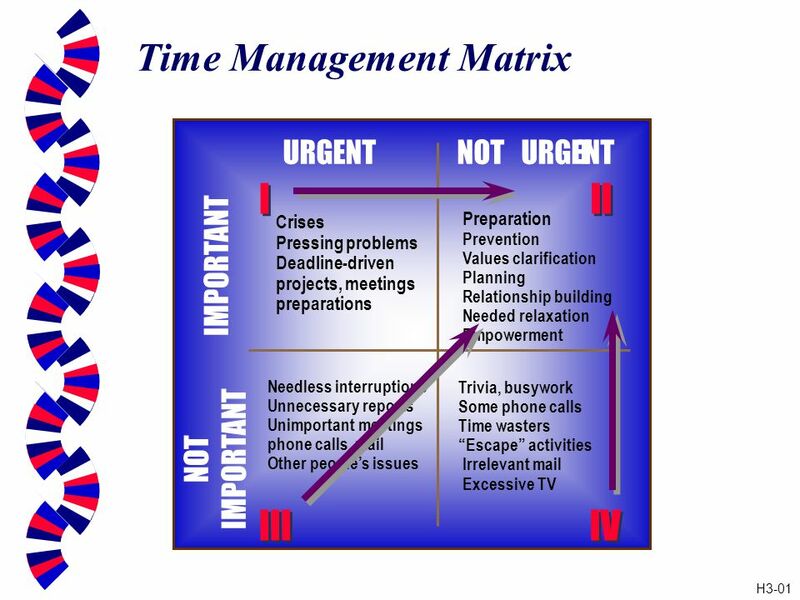 Understand what's important as well as urgent, and maintain a balance between what we produce each day and our ability to produce in the future. Think of the former as putting out fires and the latter as personal development. Metaphor for the amount of trust that exist in a relationship. 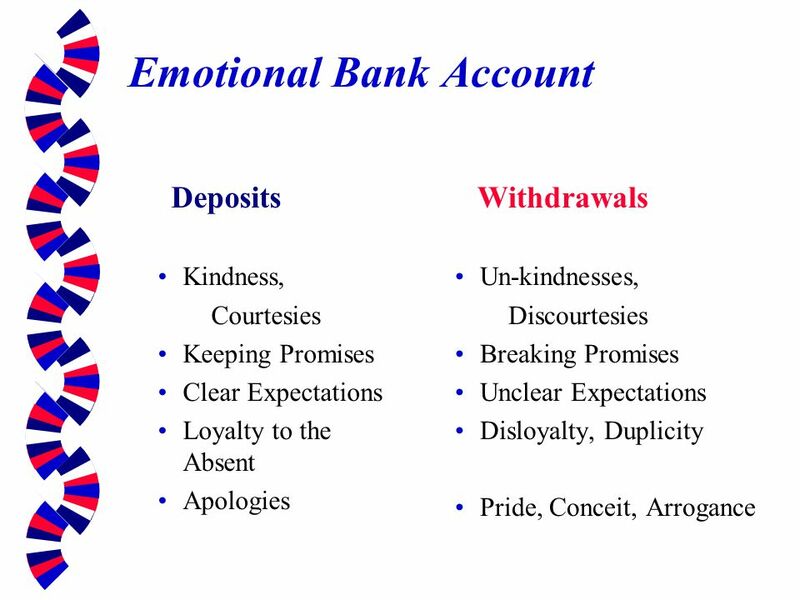 It suggests that every interaction with another human being can be classified as a deposit or a withdrawal. 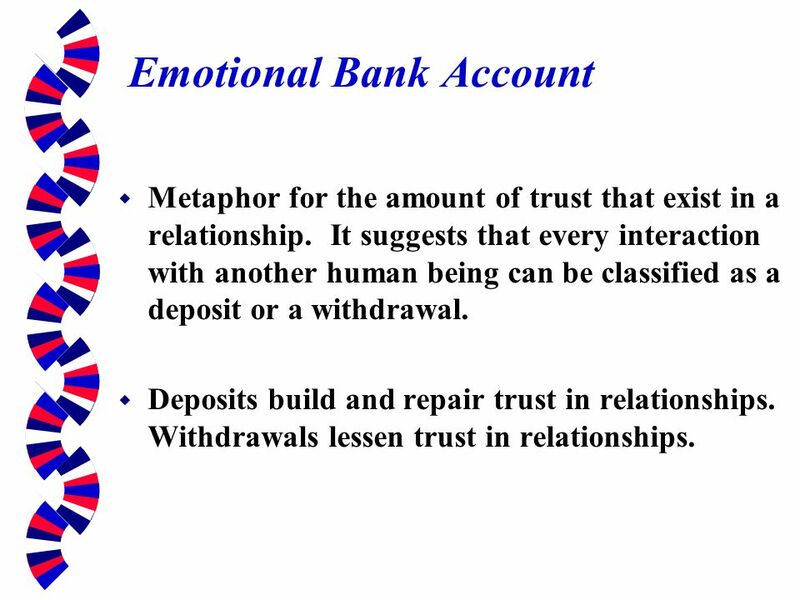 Deposits build and repair trust in relationships. Withdrawals lessen trust in relationships. 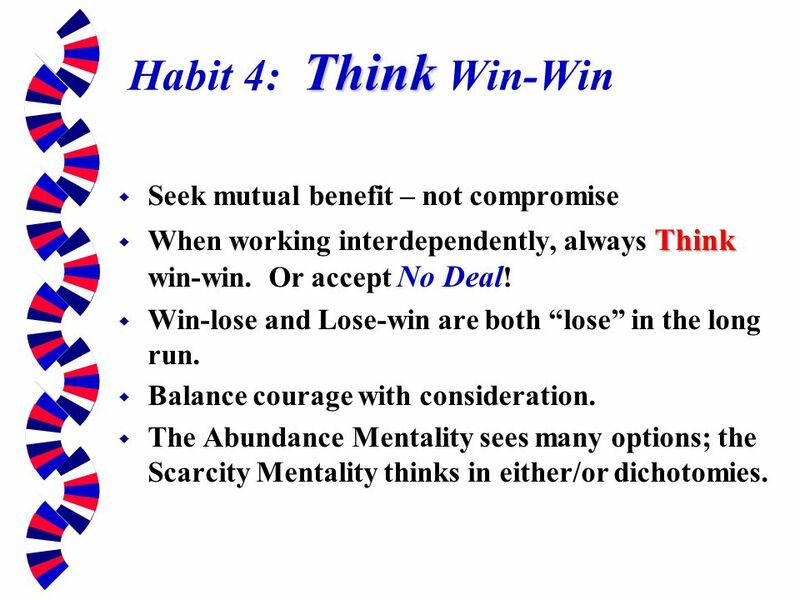 When working interdependently, always Think win-win. Or accept No Deal! Win-lose and Lose-win are both “lose” in the long run. Balance courage with consideration. 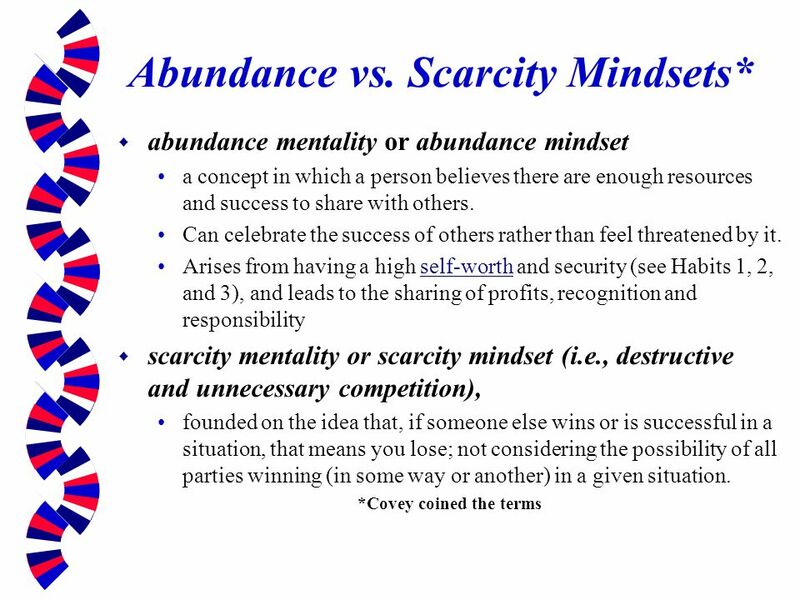 The Abundance Mentality sees many options; the Scarcity Mentality thinks in either/or dichotomies. Most people listen not with the intent to understand, but with the intent to reply. Dialog of the deaf! Our tendencies are almost entirely autobiographical. We probe, advise, interpret, and evaluate. Diagnose before prescribing. The key to influence is to first be influenced. First seek to understand the other person, and only then try to be understood. 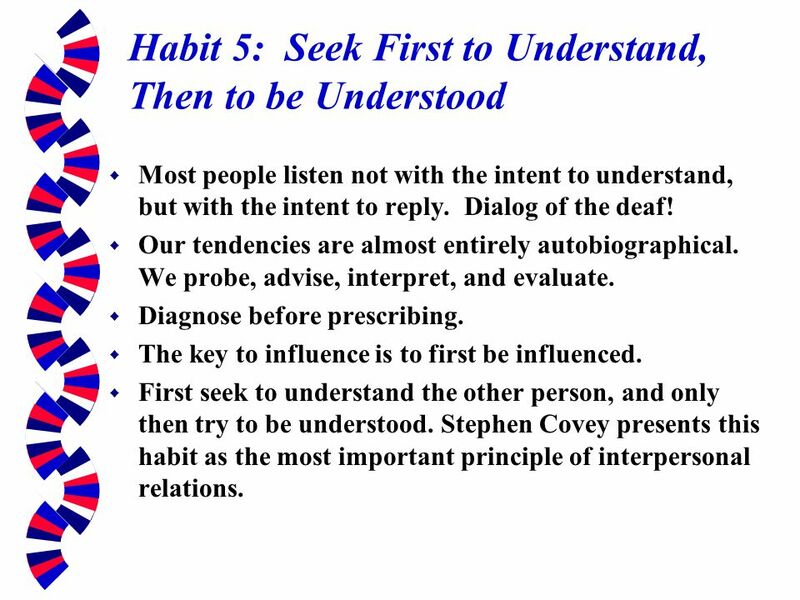 Stephen Covey presents this habit as the most important principle of interpersonal relations. Metaphor for the amount of trust that exist in a relationship. 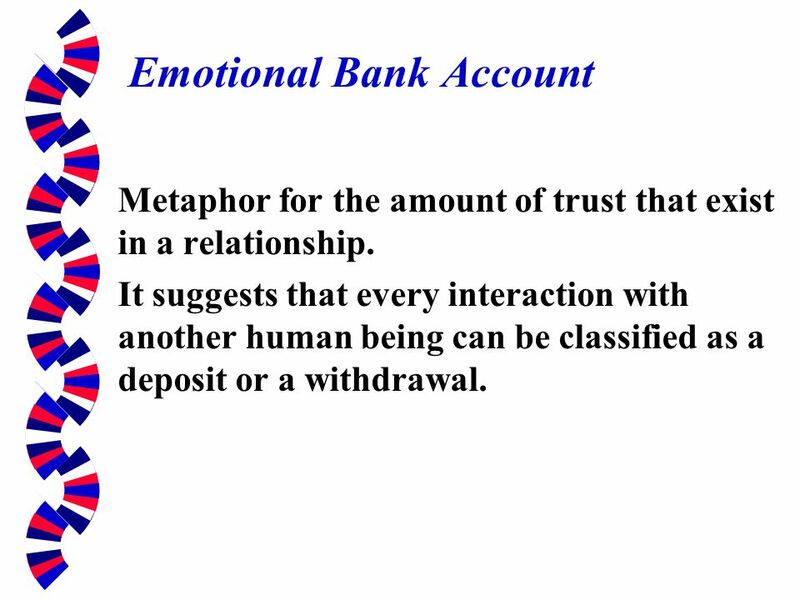 It suggests that every interaction with another human being can be classified as a deposit or a withdrawal. Deposits which build and repair trust in relationships include kindness, keeping promises, honoring expectations, being loyal to the absent, and making apologies. 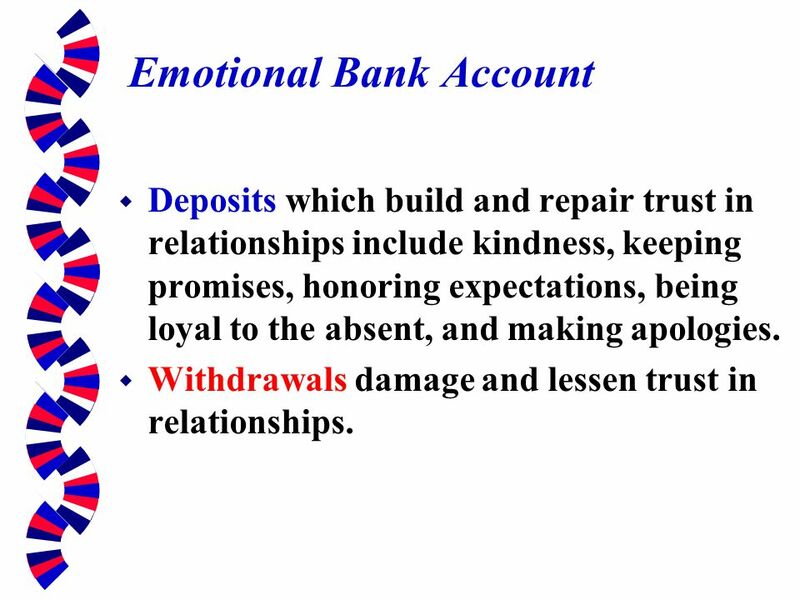 Withdrawals damage and lessen trust in relationships. 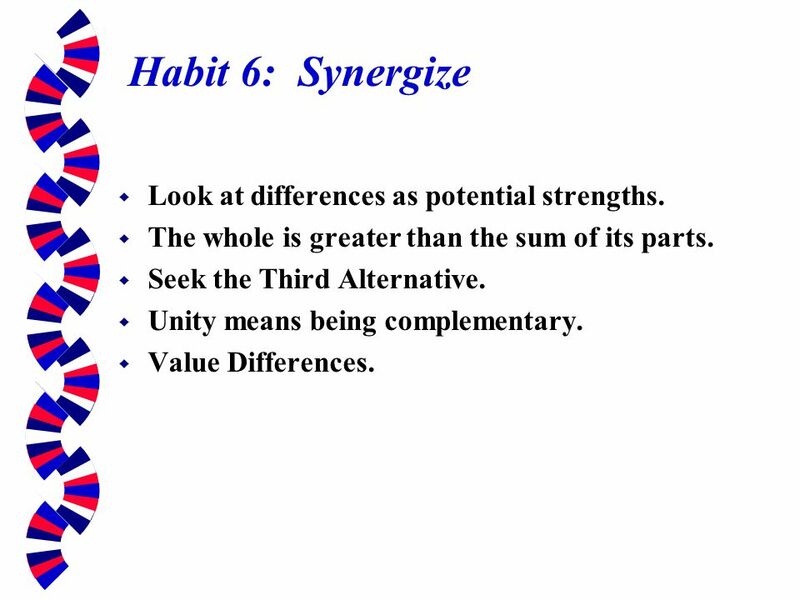 33 Habit 6: Synergize Look at differences as potential strengths. The whole is greater than the sum of its parts. Seek the Third Alternative. Unity means being complementary. Value Differences. 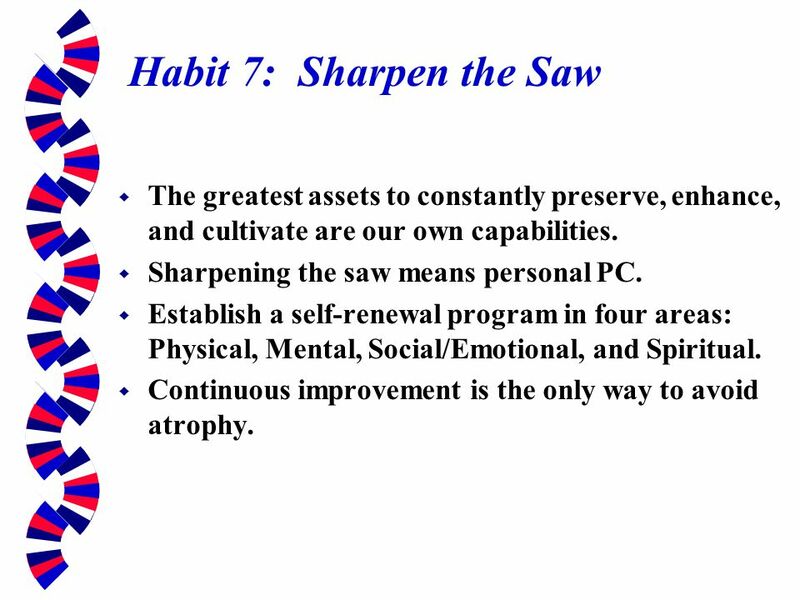 34 Habit 7: Sharpen the Saw The greatest assets to constantly preserve, enhance, and cultivate are our own capabilities. Sharpening the saw means personal PC. Establish a self-renewal program in four areas: Physical, Mental, Social/Emotional, and Spiritual. Continuous improvement is the only way to avoid atrophy. When you were born, you cried and the world rejoiced. Live your life in such a manner that when you die the world cries, and you rejoice. 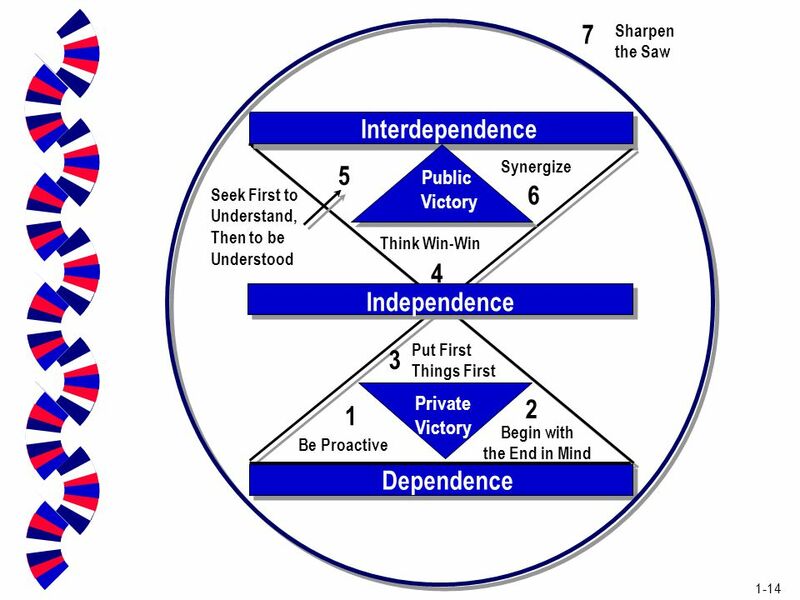 Download ppt "The Seven Habits of Highly Effective People"
The Maturity Continuum Foundation Align Paradigms With Principles Foundation Paradigm BehaviorResult Principle. Busi Foundations of Leadership Stuart A. Youngblood Dan Rogers Hall, Room 166D Phone: tcu.edu. FACILITATOR Prof. Dr. Mohammad Majid Mahmood Art of Leadership & Motivation HRM – 760 Lecture - 18. 11 Empowerment From The Inside Out Tanya Rhone Two Roads Consulting November 2008 Tanya Rhone Two Roads Consulting November 2008. 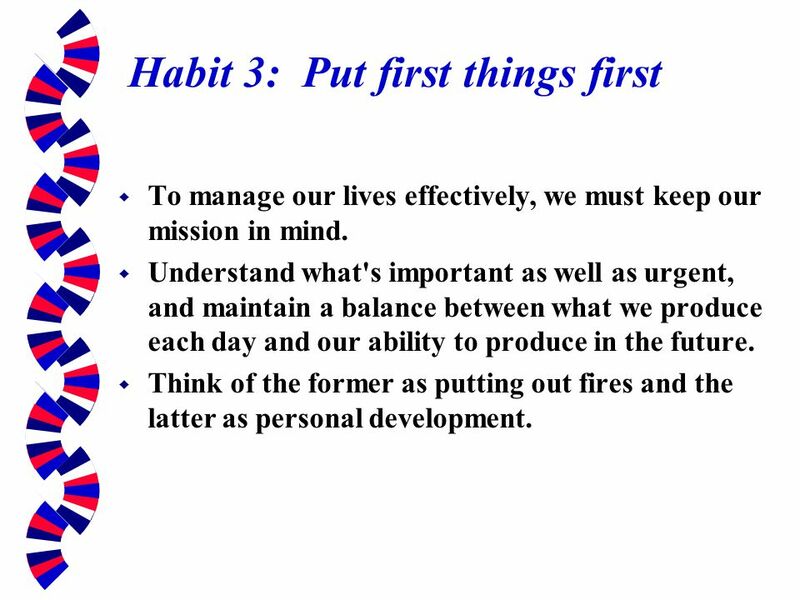 PRINCIPAL’S COFFEE HABIT ONE FROM THE SEVEN HABITS December 5, 2011 Excerpts taken from The Leader In Me by Steven Covey.